Great to have you back for the latest installment of Judge of the Week! This time we’re talking with someone who is known for his enthusiasm, his ability to step up when needed, and his strength in logistics. Time to get to know Jeff S. Higgins! I like the challenge. 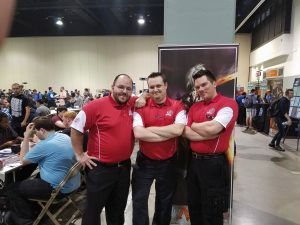 At first, I became a judge because I wanted to stay in the community during my least favorite standard (Delver season), so I tested for Level 1 with Leo Maros at Grand Prix Anaheim. From then on, I found tons of great people that made working events incredibly rewarding. Grand Prix Sacramento, I was working with On Demand Events. I was making announcements for missing players, and got to announce “Buhler, Buhler, your draft is waiting for you.” The room definitely appreciated it, and I got a memorable experience. Be honest with yourself, be honest with others. Help better others, and let others help you improve. Don’t be a hero judge, and learn from your mistakes. Scott Neiwert and I organized a week of festivities between Pro Tour Portland and the Team Sealed GP the next week. This culminated in a judge karaoke (or judgearaoke), where we got to hear Jared Sylva sing “Come and Get your Love” plus some other phenomenal singing. I was just happy to see so many people enjoying themselves. Early on in my career, I was an arrogant and boisterous figure. This, obviously, is very off-putting to people, and I created lots of negative impressions. I was fortunate to have some amazing people provide a 2-on-1, and they pushed me to understand teamwork, respect, and humility. Scott Neiwert has helped instill a calm and desire to work with the local community. He’s taught me the value of teaching judges close to you, and that’s helped me both teach others and become a better judge through new perspectives. Joe Hughto has pushed me to be honest with myself, be the best judge I can be, and understand my underlying reasons for stances on policy and judging. He’s a tremendous person, and he cares so much. Riki Hayashi has pushed me to be a smarter judge. From understanding the impact I have on others to taking time to think before acting, Riki has challenged me to not quit on the path of self-improvement. Confidence, a desire to help better others, and a stronger sense of accomplishment when looking back at challenges. Add to this a strong network of friends, and the benefits just pile up. I have really strong connections to some of the more competitive players in my area. Besides getting to draft with really skilled players every now and then, I’ve become a person they can ask about policy changes, questions on tournament happenings, and random rules interactions while brewing decks for tournaments. Many of your Exemplar recognitions speak to your mentorship and encouragement of other judges. What suggestions do you have for being a better mentor? Set a good example for others, relate to them when giving feedback, and be willing to talk outside of events. What are some of your short-term and long-term goals within the judge program? I won’t be shy and say a long-term goal of mine is Level 3. I’ve been judging heavily the past 4 years, and unless things change I want to judge another indeterminate amount of time. My short-term goal is continuing to better judges around me. 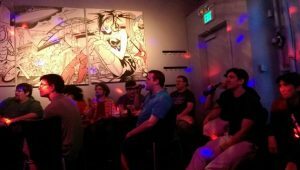 I want to create the next group of judges that make the Portland Magic community great. Tell us about the Missed Trigger Guide Project you’re involved with. Abe Corson started Missed Trigger guides to document triggers that were generally detrimental (instances where a Warning will be issued). I was a huge fan of this when I saw it at first, since it helped me understand more about our current trigger policy. There was a period of time when the project hadn’t been updated, and I messaged Abe asking if I could help re-start it. This was a great lesson about projects and how people’s life outside of judging can impact their judging life; many people who were on the project had stepped back for one reason or another. With the help of Charlotte Sable and David de la Iglesia , I carved out a section of the Judge Rules Blog and brought the project back to life! Currently we’re discussing some articles meant to teach other judges and players about the trigger policy, but in the meantime, we’re making sure judges can know what the detrimental triggers in Standard are. I was at a summer camp in 3rd grade and two friends taught me the game. We would play without sleeves on the grass while the morning announcements would happen, and I fell in love with the story and world. I have a large admiration for Franklin Delano Roosevelt and Winston Churchill. I was fascinated by their relationship, and spend many of my upper school years learning their history. -7: Target opponent sacrifices a creature, discards three cards, then loses 5 life. You return a creature card from your graveyard to your hand, draw three cards, then gain 5 life. Being asked to head judge one of the Classics at SCG Worcester. 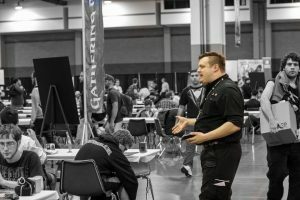 During 2014-2015, I worked every Star City Games Open in Portland and Seattle, and I decided that I really wanted to head judge one eventually. All the events I’d ever head judged had one or two floor judges, and I both wanted it as test and because I felt I’d do a good job. Fast forward to early 2016 and Riki Hayashi messages me that I was offered the Standard Classic in Worcester, MA (about 1 hour from where I grew up). I was speechless. This was it! I was finally going to experience one of my major judging goals. Before the event started, I was so nervous. All the anxiety of a brand-new experience was both terrifying and electrifying. Jon Goud , who was at the helm of the Modern Classic, gave me the advice that the hardest parts are “takeoff and landing.” Boy, was he right. I am in the credits for two Triple A video-game titles. I have never visited the mainland of Europe. I learned the Suzuki Violin from 5th grade through 8th grade. 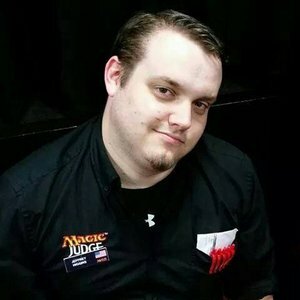 Matt does not have a mono-colored deck for each format. 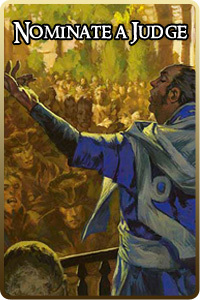 He doesn’t have a mono-colored Standard or Vintage deck, but he has one for Modern, Legacy, EDH and Tiny Leaders.